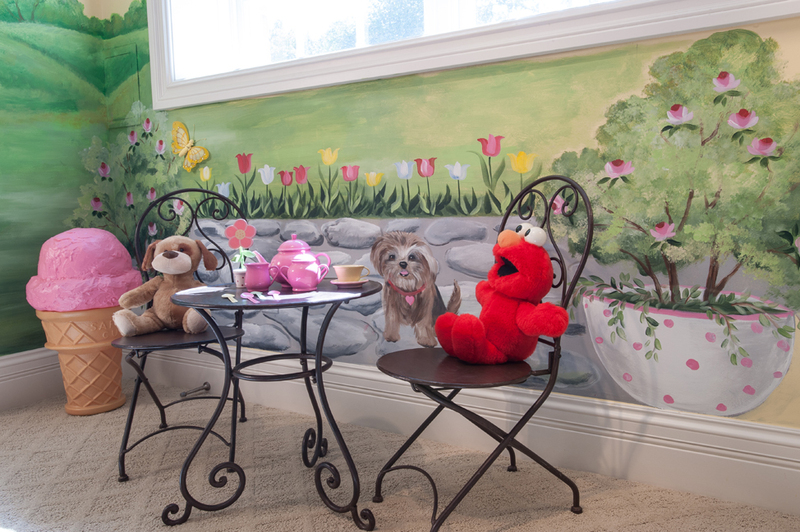 Imaginations can run wild in a lower-level playroom designed with grandkids in mind. In the lower level of the beautiful Town and Country residence of Jim and Karen Castellano, after you pass through Jim’s extensive sports memorabilia collection, you will wander into a sweet little “town” designed for their six grandchildren. 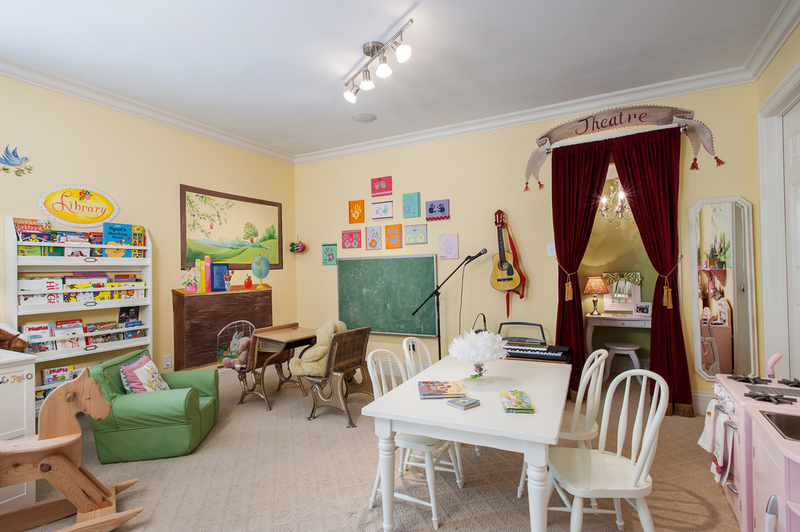 Natural light floods the lower level of the home thanks to a wall of windows into the backyard, offering a bright, clean, organized playroom filled with everything an imaginative kid could want; a theater space with a dressing room that includes a chandelier, vanity and red velvet curtains; musical instruments and a microphone. “Their favorite thing to do is put on plays,” says Karen. “They love getting dressed up in their costumes and singing and dancing!” Also featured is a library; a museum wall; a school room; a sweet pink kitchen from PB Kids and a sidewalk café. “We wanted to bring a bit of the outside indoors for the kids,” says Karen, and occasionally as the children sit enjoying “tea” at their sidewalk cafe, they may see a family of deer or wild turkeys wander by, creating an incredibly magical moment. “We designed the playroom to be next to my sewing room, so they could play while I sew,” says Karen, a talented seamstress. She found leaf fabric for the cafe windows and added climbing vines to them to create Roman shades. Deep red velvet curtains from World Market were adorned with gold fringe and a tasseled gold cord for the dressing room area. The old-fashioned desk in the school area has a lovely family history. Karen, her father and her grandfather all attended St. Aloysius Gonzaga School on Magnolia Avenue in south St. Louis. Her father was able to procure the desks when the school was being demolished, and he refinished them and gave them to Karen for her girls when they were young. Now the fifth generation of the family sits in those seats learning their school lessons. Lee Halliburton, formerly of St. Louis, painted the space in two days incorporating a palette of soft pastels, leaning mostly towards pinks and greens. A whimsical nod to the family’s love of Yorkie dogs is evident in the cafe, as well as some other sweet fuzzy friends: a bunny in the classroom, and a kitten in the kitchen window. Colorful family handprints accented with bric-a-brac adorn the wall over the school’s chalkboard. The museum is a large framed board covered with cloth that leans against the wall displaying the latest artistic renderings of the children. Ionic columns and some ivy offer a bit of gravitas. The dressing room, designed by New Space, offers plenty of storage for costumes, games and dolls. Karen and Jim's grandkids look forward to trips to grandma and grandpa's house where they can get lost in their imagination in their amazing playroom.